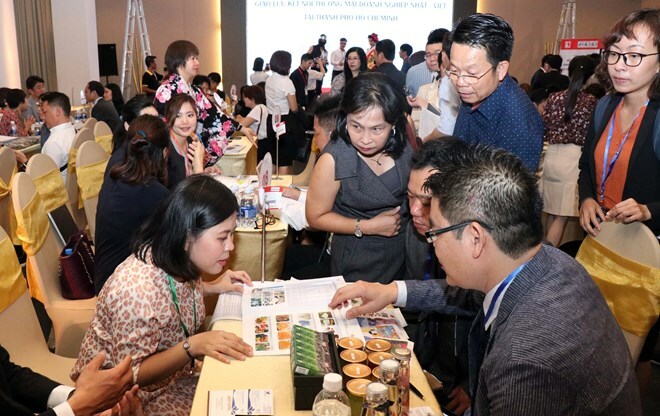 HCM City (VNA) - A business networking event was held in Ho Chi Minh City on April 12 to promote trade ties between Vietnamese and Japanese enterprises. The event, held by the Ho Chi Minh City Union of Friendship Organisations (HUFO) in collaboration with the Vietnam-Japan Friendship Association, and the Japan-Vietnam Friendship Association of Nishinomiya city in the Japanese prefecture of Hyogo, drew the participation of representatives from some 60 Vietnamese businesses and 20 firms from Hyogo and Osaka prefectures. Speaking at the event, President of the Vietnam-Japan Friendship Association of HCM City Nguyen Cong Tanh thanked the Japan-Vietnam Friendship Association of Nishinomiya city for its coordination to organise the programme, helping to connect enterprises from both countries and develop friendship and cooperation between HCM City and Hyogo prefecture in the fields of trade, economy and investment. Meanwhile, Sakai Hironori, President of the Japan-Vietnam Friendship Association of Nishinomiya city, said that Japanese companies want to cooperate with Vietnamese firms not only in economy and trade but also in social and charitable activities. Following the opening ceremony, Vietnamese and Japanese businesses joined in an exchange programme and sought partners in the fields of investment and trade, distribution of food and cosmetics, human resource supply, chemicals and fertiliser, among others.